I am often asked if I have any recommendation for an English-language cookbook for donabe cooking. 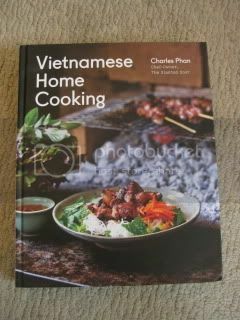 This year, my top recommendation is Vietnamese Home Cooking by Chef Charles Phan of San Francisco's popular restaurant, Slanted Door. This book contains many delectable recipes which can be made with classic-style donabe or donabe steamer, "Mushi Nabe". Yes, authentic Japanese Iga-yaki donabe are great for Vietnamese cooking, too! 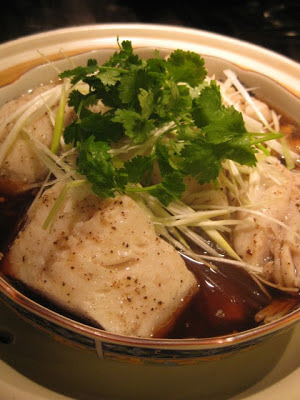 This steamed black cod dish is inspired by one of Chef Phan's recipes in the book. 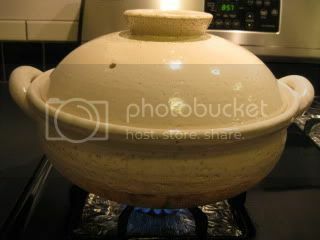 You need donabe steamer, "Mushi Nabe" for this recipe. 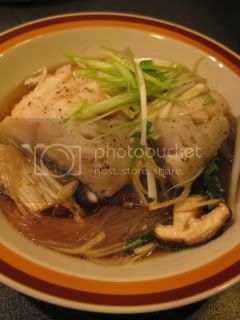 In a ceramic bowl which can fit Mushi Nabe, arrange 3oz enoki mushrooms, 4 shiitake mushrooms (sliced), and1oz dry glass noodle (cut if too long) on top of the mushrooms. Spread 1T thinly-sliced ginger shreds over the glass noodle. 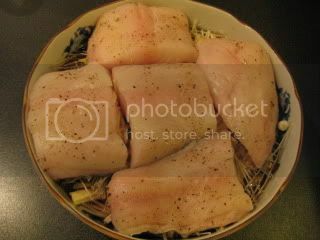 Arrange 14-16 oz black cod (cut into 4-5) on the top. The fish should be seasoned with salt and pepper and let rest for 20-30 minutes. Pat dry with paper towel before being added to the bowl. Pour the broth (3/4C Chinese chicken stock, 2T sake, 2T light-color soy sauce, 1T fish sauce, 1T raw brown sugar) into the bowl. 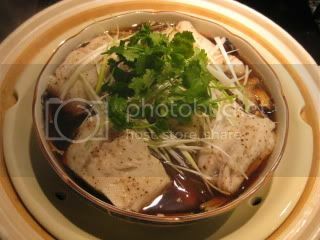 Cover and steam in the hot Mushi Nabe for 10-12 minutes or until the fish is cooked through. Garnish with thinly-sliced scallion and some cilantro. Divide into individual bowls to serve. 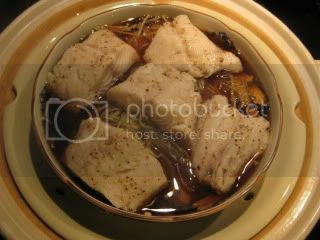 The fish is so buttery, and the broth tastes so deep with all the infused flavors with the ingredients. This dish is really great.